Many challenges confront researchers attempting to express recombinant proteins. Post-translational modifications, quantity produced, and recapitulating function are chief among them. These and other issues will be discussed at CHI’s “Difficult to Express Proteins” conference to be held later this month. Cutting-edge solutions include new ways to optimize gene sequences, novel fusion proteins or tags, and enhancements to functional assays for membrane proteins. To address this issue, DNA2.0 embarked on a detailed analysis in which it designed and independently synthesized about 40 genes each for two proteins, a DNA polymerase, and a single chain antibody. Each set systematically sampled codon usage and other variables thought relevant to protein expression. Polyketides are natural products produced by plants, fungi, and bacteria that represent a diverse class of compounds with a broad range of activities useful for many applications ranging from anticancer agents to antibacterials. However, these small molecules are so sufficiently complex that they cannot be easily synthesized through organic chemistry. To produce them recombinantly has also presented significant gene-expression challenges. Some researchers opt for cell-free protein expression, i.e., in vitro translational systems. Benefits include compatibility with microliter-scale reactions and faster expression, since traditional cell-based expression can take from days to weeks. However, current in vitro expression systems suffer from low yields or the inability to include post-translational modifications such as glycosylation, according to Brian Webb, Ph.D., platform manager of proteomics R&D at Thermo Fisher Scientific. One application is the simultaneous study of numerous mutant variants in a microplate or expression of large quantities of a single protein for future experiments. Other uses include enabling expression of toxic proteins that cannot be produced in live cells, analyzing protein-nucleic acid interactions, and studying protein complexes. 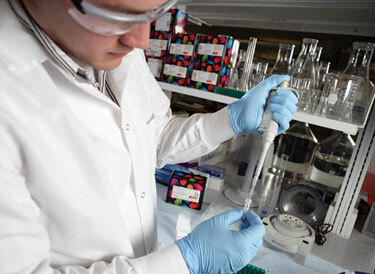 Thermo Scientific Pierce human in vitro translation technology synthesizes protein in human cell-free extracts. The human translation machinery imparts superior functionality compared to alternative systems such as rabbit, E. coli, or wheat germ systems, the company reports. Adding tags to recombinant proteins is a convenient means to monitor and/or purify proteins of interest. Traditional tags include fluorescent proteins (e.g., green fluorescent protein) and affinity tags such as glutathione-S-transferase (GST) and 6x-histidine (HisTag). To show the utility of the HaloTag purification system in E. coli, the company targeted 23 difficult-to-express proteins. “We found that HaloTag provided superior solubility, purity, and yields compared to HisTag, GST, and MBP (maltose binding protein),” Dr. Ohana says. 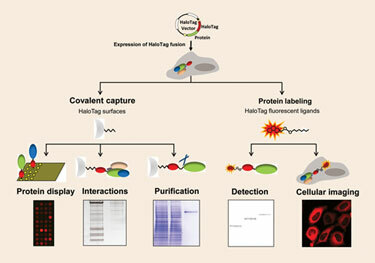 HaloTag® is an enabling technology for protein analysis. According to Promega, a single genetic construct can be combined with multiple ligands for different applications. Another novel tagging and detection system has been developed by Geoffrey Waldo, Ph.D., team leader, biosciences, Los Alamos National Laboratories. “Existing small tags usually require a labeled antibody or the like,” he says. “These can be hard to use especially in living cells. We are trying to overcome this by making families of tiny tags and a specific detector protein for each tag. The detectors bind like antibodies to each particular tag. Dr. Waldo is applying the technology to protein trafficking, protein interaction detection, high-throughput measurement of soluble protein in living cells, and engineering proteins for stability and solubility. Aminoacyl-tRNA synthetases within cells serve to ligate a specific amino acid with its cognate tRNA. The tRNA subsequently contributes that amino acid to the growing peptide chain. Researchers at Princeton University are harnessing that power to incorporate unnatural amino acids as novel tags in recombinant proteins. Functional groups such as azides and alkynes have emerged as chemical handles to help couple tags to proteins. Dr. Link found that an efficient way to introduce such functional groups is via incorporation of unnatural amino acids. Once azidonorleucine has been introduced into a protein, the click chemistry reaction (a reaction between azide and alkyne functional groups) can be used to tag the protein with a wide variety of tags including biotin, fluorophores, polymers, and even conjugated metals for imaging applications. Dr. Link is now working to utilize the bacterial strain in producing uniquely substituted proteins and as a tool for modeling host-pathogen interactions. Membrane proteins not only can be difficult to express but also to purify and assay. Many researchers approach the study of membrane proteins by over-expressing recombinant fragments of membrane-associated enzymes and studying their activity in solution. However, this can be a daunting challenge for many assay systems, according to Scott Gridley, Ph.D., director of bioproducts at BlueSky Biotech. While daunting challenges remain in the arena of difficult-to-express proteins, new paradigms in expression science are helping pave the way for solving those problems.